Fox freed from soccer net in Bucks County. Unfortunately, wild animals are sometimes the victims of civilization's encroachment on their natural habitats. To the best of our ability, we try to help them out of trouble, hunt responsibly and peacefully coexist with them in our communities. 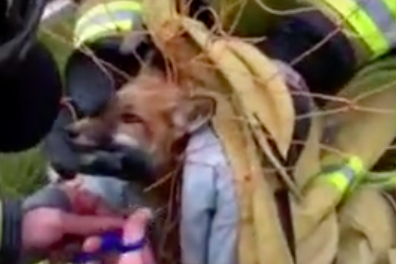 One fox in New Hope got itself into a knotty situation over the weekend that required assistance from the New Hope Eagle Volunteer Fire Company in Bucks County. The poor thing was discovered Saturday morning in a soccer net at a local field and later cut free with help from the Solebury Township Police Department. Firefighters posted a video of the rescue on Facebook, where it's since been making rounds.